A peaceful manmade lake in the heart of Cuyahoga Valley National Park. 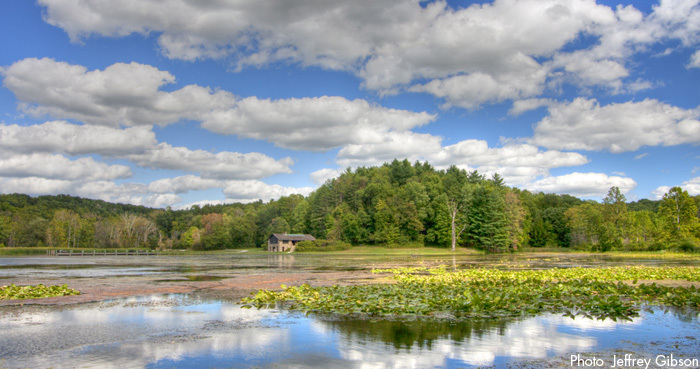 Created by the Civilian Conservation Corps in 1935, Kendall Lake is the largest lake in the CVNP—one which spans a dozen-plus acres and represents one of Northeast Ohio’s biggest draws for both paddlers and anglers alike. The lake was created by the Civilian Conservation Corps in 1935 by damming Salt Run. More recently, due to a 2003 flood and sedimentation, NPS conservationists had to rehabilitate the lake. Today, it’s teeming with channel catfish, bass and bluegill. The connecting Salt Run tributary brings water from the lake to the Cuyahoga River. This quiet but active space that brings all of the wonder of the Cuyahoga Valley into focus for locals and tourists alike. Wetlands and the anticipated wildlife abound—count on spotting everything from beavers in the early morning and late evening, to owls, Canadian geese and other waterfowl throughout a day there. The surrounding trail provides a backdrop that is chock full of cattails, scotch pine, cherry, maple and hickory, hazelnut and dogwood trees. Hikers will love the picturesque loop surrounding the lake, which is often occupied by the region’s many paddlers and anglers during the spring and summer months. Amateur photographers (and perhaps even a landscape painter in your life) will get a charge out of the sheer beauty of the lake—especially during the change of seasons. Gorgeous vistas abound: late fall and early winter pulls people from being on the lake itself, but you can still hike around it or rent snowshoes from the nearby Winter Sports Center.